Never underestimate the protective instincts of a Moma cat. 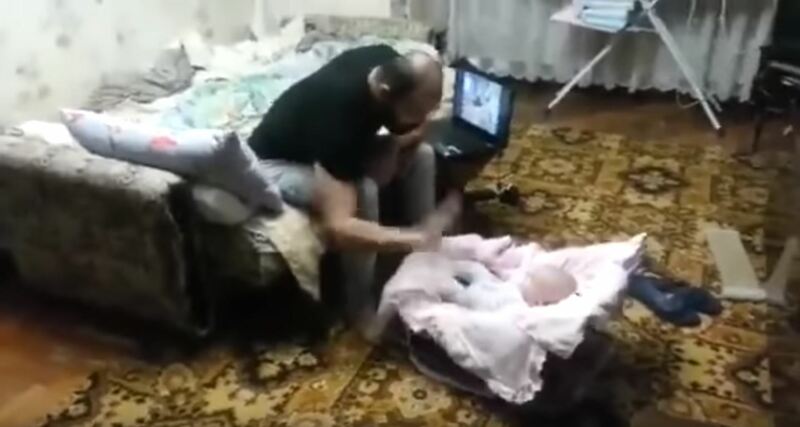 That’s what this man found out when he was trying to entertain his baby. Dog’s have long been known as man’s best friend. A tag well earned over many centuries of faithful service right at man’s side every step of the way. From hunting to scouting, police work to tracking, seeing-eye dogs to good old fashion canine companionship. Cat’s have long been thought of more individualistic, some may say independent, perhaps even self-centered? But over the past few years people are beginning to see another side of cats, a side many never expected to see. There’s a couple of recent stories of cat’s seeing off bears, even the female cat Tara that saved a little boy from being mauled by a dog. And here we have another example of that protective side. This Dad is slapping the side of the babies cot maybe a little too vigorously trying o entertain the baby. Baby is happy laughing away kicking her legs in glee, which of course encourages the Dad to continue. Back in another room the cat hears this and comes out to investigate. She sees things very differently and takes protective action, feline style. She attacked the baby’s Dad quite forcefully at least three times, not at all happy with what was going on, the last two attacks hitting home and making this baby entertainer see to his hard-earned wounds. Watch What Happens To This Kitten When Someone Rings The Doorbell. Wait for it…….Keep Watching! Watch What She Does When Her Cat Brings Her A Gift, And It’s Still Very Much Alive! Whenever She Does Her Laundry Her Cat Does This.